“Jabal-Hajar-Turab #3” is an installation that began with Younes Rahmoun’s travels between Morocco, Syria, and Jordan where he arrived in order to exhibit his work. In area around the ghorfa in the Rif, the artist gathered a small amount of earth that he kept in a jar as well as a pebble and a stone. Once in Damascus, he climbed to the top of the Qassioun Mountain where he exchanged the Rif stone for a stone that he found there. 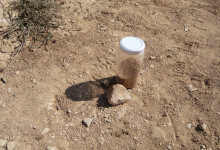 He looked for a pebble the resembled the one he found in the Rif and he left a little bit of Rif earth there while also taking a bit of earth from Qassioun, which he added to the jar. In Amman, Younes Rahmoun decided to visit the Cave of the Seven Sleepers to complete his ritual once again. He looked for a rock similar to the one found in Damascus and exchanged it, he found and kept a pebble similar to the one he found in Damascus, he left a bit of the mixed earth from the Rif and Damascus, and then he took a sample of earth, which he added to the jar. The artist kept these elements gathered during his travels and placed them near the ghorfa, the place where the journey began. In Amman, he exhibited photographs of the different elements alongside his travel notebook. Their placement on the ground invited the viewer to squat down and thus to mimic the artist’s position when he collected the natural elements. On the red walls of the gallery, Younes Rahmoun drew forms recalling the different mountains with white chalk.